For me, one of the most frustrating parts of eating the way I do is that if you don't remember to plan your meals or your schedule goes awry and you're suddenly limited on time, then you're stuck trying to find out how to get some quick but healthy food on the go or on the fly. Sometimes you have to do what you have to do, but its hard to make compromises when you really don't want to eat food that's probably going to make you sick later. Or maybe you've just had a really long day, and you want to throw something together that's quick and easy and doesn't require a lot of thought or effort. There's always an egg or salad, but if you're wanting something a little different, then you really need a little bit of "paleo fast food". I always have individually-wrapped hamburger patties in the freezer (along with some pre-divided chicken), and they are my go to meal when I need something quick because I can pull them out and defrost them fairly quickly. And of course this week, I have lots of pesto on hand since I needed something to do with the overload of basil from my garden. 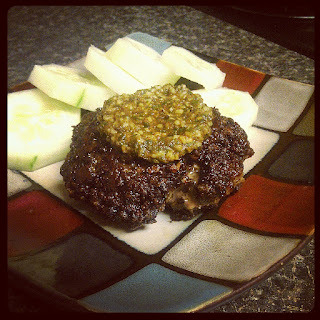 So let's get a little creative on the fly and jazz up your plain ol' hamburger patty with a little bit of pesto love. Salt and pepper your hamburger meat. Add 2 tbsp of pesto and mix together thoroughly. Reform into patty. If you have a gas grill, fire it up and skip the bacon fat. Cook like a regular hamburger. If you're using a skillet, heat up the bacon fat over medium-low heat and add your burger to the pan. When it's cooked to your desired temperature, put on a plate and top with more pesto. Serve with a side of sliced cucumbers or a bed of spinach or even fresh sliced tomatoes.